Following yet another purported video of Niburu which is actually Aldebaran, (see Dave Greg's pictures here) may I suggest some things that people should do before releasing these videos/images. 1) Check to see that it s not a known object. There are lots of smartphone apps that can show you the sky from your location, with all the bright stars and planets shown. If a smartphone app is not for you, there are a number of free planetarium programs which can show you the sky, and even simulate the field of view of you camera. Stellarium, Sky Cafe and Cartes du Ciel are all good ones. Paper based charts are good for brighter objects. This is the first step that comet and asteroid hunters do when they spot a possibly unknown object. 0) *Make sure you know the characteristics of your imaging system. Use a tripod for taking shots. Do some test shots of known astronomical objects (autofocus is notorious for turning stars into disks. If you can turn off autofocus and set focus to infinity, do so). 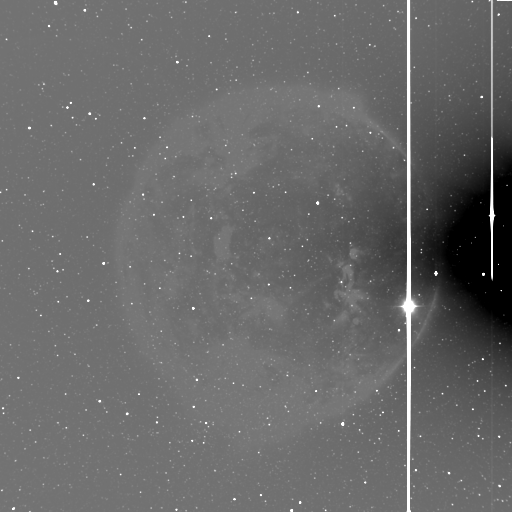 An unusual artefact in the STEREO H1A imager from 21-3-2011. This has been mistaken for a planet, but the object is transparent, real planets aren't transparent. It is visible only on a single frame. The supposed illuminated crescent is on the side away from the sun, and the object is roughly 2 degrees wide, 4 times the diameter of the sun and moon. On 21/3/11 Venus was easily observable in the morning sky, we would have noticed an object 4 times the size of the moon next to it. If you are using STEREO/SOHO images, check the planets and artefacts pages (also see here where the optic assembly is explained.) to make sure it's not a known bright planet (like Mercury in this COR2B video) or artefact. The same goes for images from Google Sky, Wiki Sky and the World Wide Telescope. These are all assembled from scans of 50+ year old Deep Sky Survey plates, and have a variety of artefacts on them. 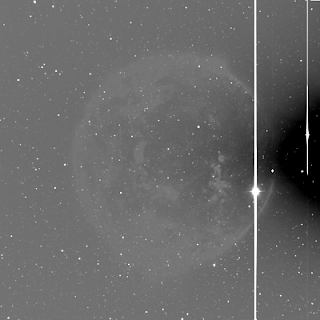 Similarly images from Neumayer Station webcams have a variety of lens flare artefacts that are claimed to be planets (see this one where a star is shining through the "planet"). 2) Get someone to independently verify your find. If someone can see the same thing from a different location you may be onto something (provided you have already eliminated Venus, Jupiter and various bright stars). This is the second step that comet and asteroid hunters do when they spot a possibly unknown object. 3) Follow up. Is the object there the next night/morning? Has it moved? Watching an object (usually with the independent observers you recruited in step 2) over several days establishes what kind of object you are tracking. If it doesn't move with respect to known stars, then it is probably a misidentified star. Again, follow up is an important part of comet and asteroid hunting, identification is not usually submitted until there is at least one days follow up. These simple precautions will prevent you from the excruciating embarrassment of posting images of the Pleiades, Aldebaran and the like as "Nibiru" (see also here). As well, you will become more familiar with our beautiful sky and who knows, you might even discover an unknown comet or supernova! * why isn't this number 1, because many people find things before they have a chance to check out the imaging system. Aurora happening in Tasmania NOW! Carnival of Space # 265 is here!